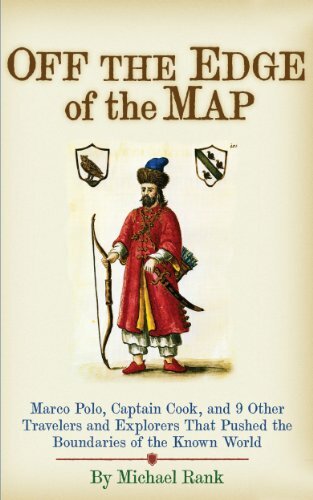 Back to Work Monday – But Not Without Saving BIG From Today’s Kindle Daily Deals Featuring Off the Edge of the Map: Marco Polo, Captain Cook, and 9 Other Travelers and Explorers That Pushed the Boundaries of the Known World – Now 75% Off! Whether it is Rabban Bar Sauma, the 13th-century Chinese monk commissioned by the Mongols to travel West form a military alliance against the Islam; Marco Polo, who opened a window to the East for Europe; or Captain James Cook, whose maritime voyages of discovery created the global economy of the 21st century, each of these explorers had an indelible impact on modern society. This book will look at the 11 greatest explorers in history. Some traveled for religious piety, such as Ibn Battuta, who travelled from North Africa to Indonesia in the 1300s, visiting every Islamic pilgrimage site between — and becoming counselor to over 30 heads of state. Others traveled for profit, such as Ferdinand Magellan, who wanted to consolidate Spain’s holdings on the spice trade. Others traveled for the sheer thrill of adventure, such as Victorian explorer Richard Francis Burton, who learned 29 languages, went undercover as a Muslim on a pilgrimage to Mecca, and wrote 50 books on topics ranging from a translation of the Kama Sutra to a manual on bayonet exercises. Still others travelled for discovery, such as Ernest Shackleton, who led two dozen men to the bottom of the world in an attempt to cross Antarctica on foot. Whatever their reason for discovery, these explorers still inspire us today to push the limits of human achievement — and discover something about ourselves in the process.